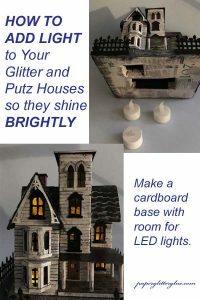 Traditionally little glitter houses were lit by a bulb that was inserted in the back of the house. 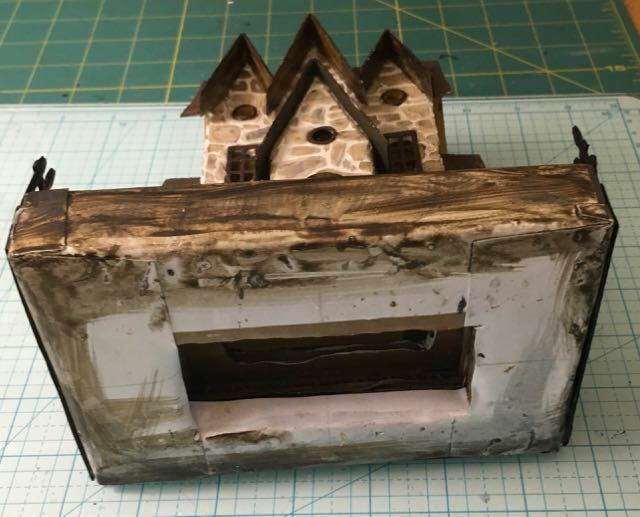 Sometimes people would take their Japanese Putz houses and cut a hole in the bottom to insert a light bulb, but the houses were not made that way. I still usually cut a hole for a light bulb in the back, but I don’t make it as big as I used to because we have LED lights now which are smaller and more powerful. What I’ve started doing on some of my houses is cutting a rectangle in the base to fit 2-3 LED tea lights to illuminate the houses. I think the first one I did it on was the Abandoned Italianate House. 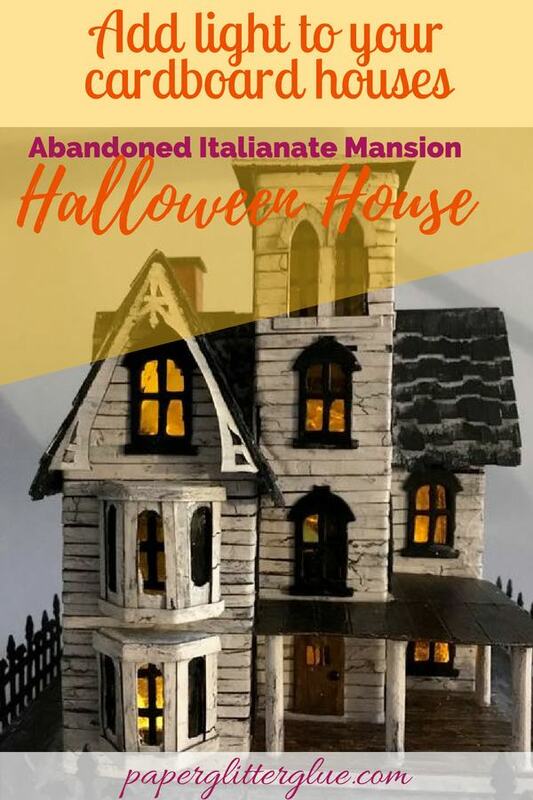 Cardboard base for the Abandoned Italianate Mansion with cut outs for LED lights to make the house shine in the dark. You can see well this works for lighting the house. Also, the body of the tea light doesn’t show up if you look in the house. I’ve done it on my last 2 textured houses as well. Messy bottom on the Stone House, but you get the idea. I’m going to go into a little more detail on how I made the base for my last house. First, I’ve found it takes about 6 layers of cardboard for the depth of the base to cover the white bottom portion of the light. 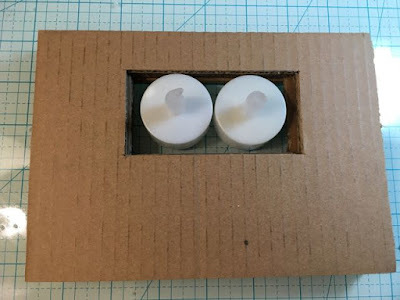 This is important in the this case because the diameter of the light is 1.5 inches and the width of the last 3 stone-textured houses I’ve made is 1.25 inches. 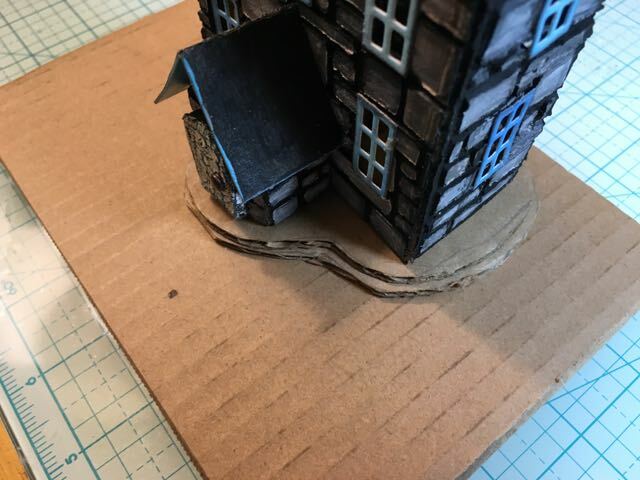 I made them narrow to both save space and to be able to cut the entire house out of a 8.5 x 11 inch piece of cardboard. So I add a smaller piece on top to make a “hill” and to reduce the size of the hole and allow me to glue the house down effectively. Six layers of cardboard with a 1.75 x 3.25 rectangle cut out. This photo shows how the “hill is made” to make the opening just a little smaller. You can see how the house sits on the hill. I didn’t take more photos of the process of gluing the base together because my hands are always covered in the thick layer of glue for this part. 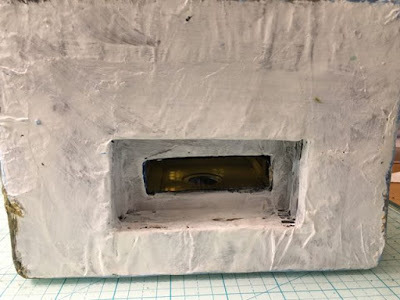 I coat each layer of cardboard with glue, usually mod podge with a paint brush and then cover it with scrap paper or cardstock or newspaper which is also heavily coated with Mod Podge. I often wrinkle the paper so the ground is lumpy and and a little more natural looking. Then I paint it with gesso and acrylic paints. Here you can see into the house and see a little bit of the hole for the light in the back. When you want to insert the lights you just pick up the house and center the house over the LED lights and they fit very nicely. Making bases for my little houses is not one of my favorite things in the creative process, but when I get them right, they really help make the house. 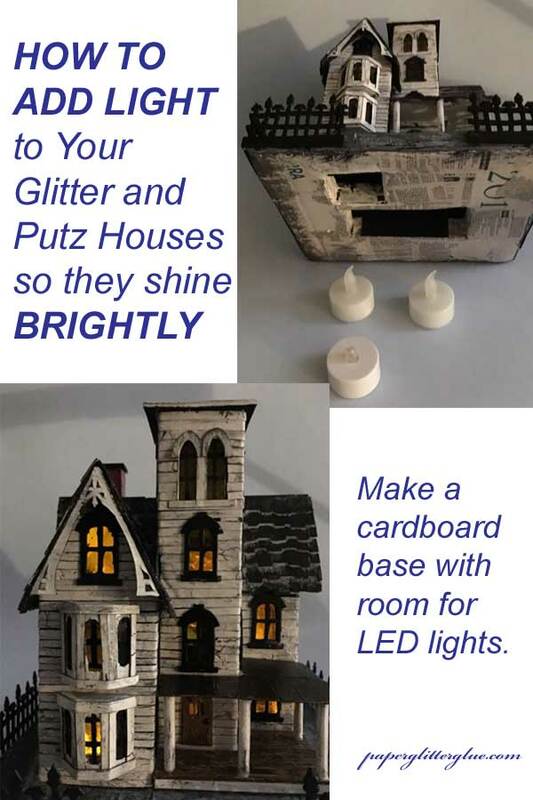 Pin this to remember where to find the directions for making a cardboard base to light up your little houses. I am having the best time reading all your posts Lucy! Thanks for sharing your base making process and showing the way you make the holes for the tea lights. 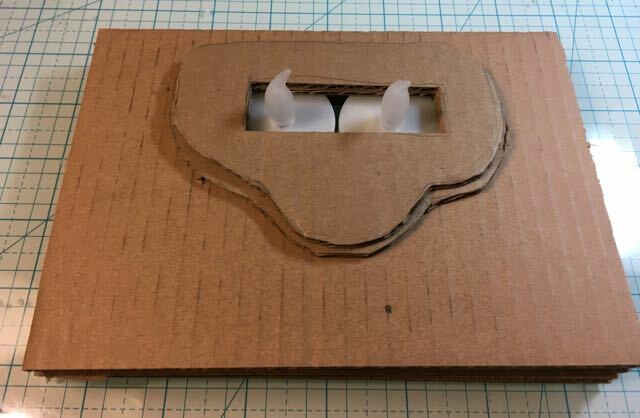 Do you wrap each piece of cardboard in paper before you glue them all together? Or do you wrap the base in paper as a whole after all the layers are glued together? I first glue all the pieces together and while they are still wet with glue, wrap them in newspaper or scrap paper or even cardstock. I use cardstock when I am making a nice clean edge. I hope that helps. Thank you for asking these questions. It makes me feels like someone is reading my posts. Do most people light them with the tea lights or a string of lights? I’m unsure of how to make mine. They will be the smaller houses. Or should I just stick with the hole in the back? 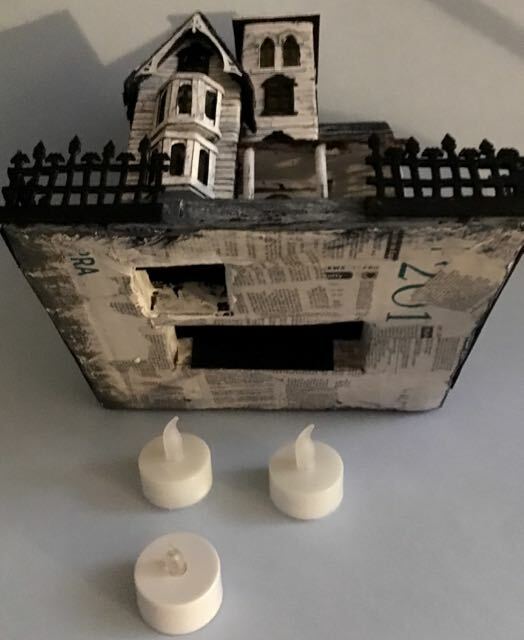 I’ve even toyed with the idea to make the back have a door to put a tea light or string light. Help! Lucy, I always enjoy your posts. You explain not only how, but why. 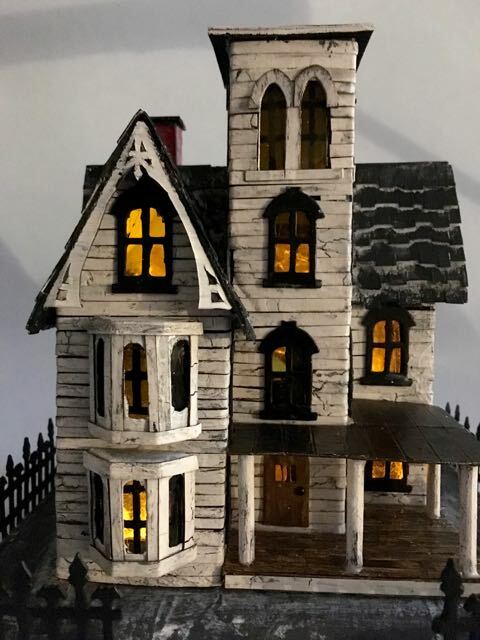 The crackled siding projects are awesome! Bonnie, thank you for telling me that. I always look forward to seeing your projects.